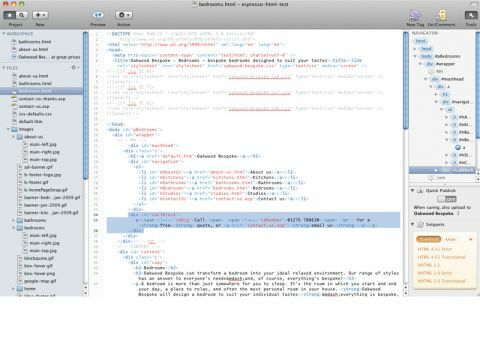 Another coding app enters the fray, but can it best Coda, TextMate and BBEdit? Espresso is for web designers who favour hand-coding. You define projects, set publish settings, and select files from the sidebar to open and edit in the work area. Items can then be dragged to any window's workspace. Espresso's responsive text editor shines. It lacks the shortcuts flexibility of TextMate and BBEdit but nonetheless enables rapid coding: formatting and selection tag-wrapping options are solid; code folding and the navigator enable-code sections can be collapsed and selected; and page-specific and project-wide text-find tools work nicely. Elsewhere, Espresso is less consistent. The interface is sleek, but sometimes feels a little confusing. Previewing is hit and miss: CSSEdit-style CSS overrides are included (to see how local CSS edits affect a live site) and, unlike Coda, previews can live in separate windows; but local servers aren't supported, restricting web page previews to flat HTML sites. Publishing is better, and offers a Quick Publish switch, to save and upload changes simultaneously. Overall, Espresso is a good app, but its workflow and interface is inferior to Coda's, and TextMate and BBEdit are better text editors. Consequently, Espresso currently feels a little overpriced and feature-light. With local server support and some interface refinement, it would appeal more to pros. As it stands, we suggest sticking with MacRabbit's other app, CSSEdit, for CSS work, and TextMate, BBEdit or Coda for everything else.